No one has enough time to cut veggies using a Knife and a Chopping board. If you’re an inexperienced person, you might end up hurting yourself, during this process. Not only cutting veggies, there are many time consuming processes like Grinding, Shredding items like cheese, Pureeing and Mixing and kneading dough. 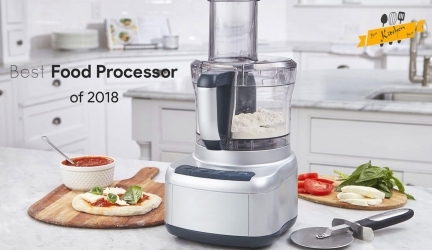 Well, a single Food Processor can perform all this process without you even having to apply any force! Sounds like a must have Kitchen Appliance, correct? Well, it is in 2018! A Food processor is comparatively similar to blenders. But one should prefer a food processor over a blender because well, a food processor is a blender and more! It has interchangeable blades and disks, whereas a blender has a fixed blade.